Chelsea had a season to forget in 2017/18, but there’s reason to believe they could do what they always do and bounce back this summer with a strong enough performance in the transfer market. The Daily Express are among the sources stating that the highly-rated Maurizio Sarri looks set to replace Antonio Conte as manager, in what looks the right move for the Blues as things turned sour under their current boss. 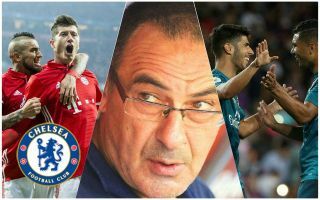 That report also gives a long list of targets Chelsea could pursue under Sarri, among those being Bayern Munich goal machine Robert Lewandowski. The Poland international’s future at the Allianz Arena looks in real doubt this summer and links with Chelsea won’t die down, with previous talk that he could be available for around £80million, according to the Daily Mirror. In another exciting move in attack, it’s claimed Sarri wants Marco Asensio from Real Madrid, according to Don Balon. The Spain international would be ideal as a long-term replacement for Willian and Pedro out wide, joining Lewandowski and Eden Hazard in a stunning new-look front three that looks a serious step up from relying on the likes of Alvaro Morata there last term. He won’t come cheap, however, with another recent Don Balon report stating Real Madrid want as much as £132m for the 22-year-old, but that’s the kind of money Chelsea need to be able to pay now to keep up with the likes of Manchester City in the transfer market. Elsewhere in the squad, Chelsea have also been linked with what could be an important signing in defence for a bargain fee as they’ve agreed a £30m deal for Juventus defender Daniele Rugani, according to Sport Italia, as translated by the Metro. The Italy international would surely be an upgrade on ageing under-performers like Gary Cahill and David Luiz at the back, and perhaps provide CFC with a long-term replacement for John Terry. Finally, Chelsea could also do with a top class midfield signing after so many mistakes in that position in recent times. Having sold Nemanja Matic to Manchester United last summer, the west Londoners have since signed flops like Tiemoue Bakayoko, Danny Drinkwater and Ross Barkley in that area. Corriere dello Sport claim they’re after Juventus’ Miralem Pjanic for around £70m, and he seems the perfect creative player to have alongside N’Golo Kante in the middle of the park.